Vinatieri made both field-goal attempts and converted all four extra-point attempts in Sunday's win at Oakland. 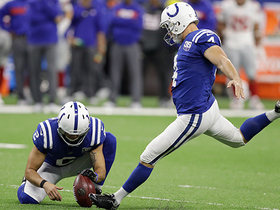 Vinatieri passed kicker Morten Anderson as the NFL's all-time leading scorer with his second field goal. Analysis: Vinatieri now has 2,550 career points. He's made 11 of his last 12 field-goal attempts and shows no sign of slowing down at age 46. He also looked back to full strength after dealing wiht a sore right groin muscle last week. Vinatieri (right groin) is listed as active for Sunday's game against the Raiders. Analysis: Through seven games to date, Vinatieri has recorded 53 points, numbers that have made him a serviceable fantasy option this season. He uncharacteristically missed two extra points last weekend, but the 45-year-old kicker will be out there Sunday, now just five points shy of breaking Morten Andersen's NFL record for career points (2,544). Vinatieri (right groin) is listed as questionable for Sunday's game against the Raiders after practicing fully Friday. Analysis: Despite the "questionable" designation, coach Frank Reich noted Friday that Vinatieri will likely will be able to kick Sunday, per Andrew Walker of the Colts' official site. Supporting that notion is that Vinatieri remains the only kicker on the team's roster. Coach Frank Reich relayed Friday that Vinatieri (groin) will likely play Sunday against the Raiders, Zak Keefer of The Indianapolis Star reports. Analysis: For his part, Vinatieri indicated that he's planning on kicking this weekend, though it remains to be seen if he ends up being listed as questionable for Sunday's game, or is removed from the Colts' final Week 8 injury report. Vinatieri (groin) was spotted at Friday's practice, Zak Keefer of The Indianapolis Star reports. Analysis: Vinatieri was unable to practice Wednesday due to his groin injury, but it looks like he will be able to get some kicks in for a second day in a row. 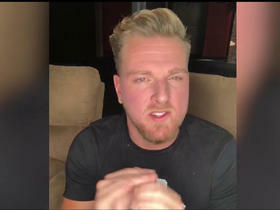 His status for Week 8 has not yet been decided, but there is reason to believe he will give it a go. Vinatieri (groin) was a limited participant in Thursday's practice. Vinatieri (groin) didn't participate in practice Wednesday, Kevin Bowen of 1070 The Fan Indianapolis reports. Analysis: The Colts still hope that the veteran kicker will be available for Sunday's game against the Raiders, but he's starting the week off on the wrong foot by missing Wednesday's session. Vinatieri still has two more opportunities to practice and the team has yet to sign a kicker to its roster, suggesting that he's still viewed as a possibility for the weekend. The Colts maintain hope that Vinatieri will recover from his groin injury in time to serve as the team's kicker Sunday against the Raiders, Mike Garafolo of NFL Network reports. 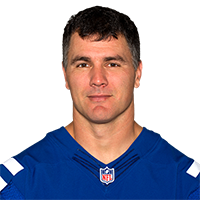 Vinatieri (groin) will be listed on the Colts' injury report this week, but no decision has been made on his availability for Sunday's game in Oakland, George Bremer of The Anderson Herald Bulletin reports. Analysis: An MRI on Monday seemingly brought good news regarding Vinatieri's health, though it doesn't necessarily mean the 45-year-old will avoid an absence altogether. The Colts could work out kickers over the next few days and sign one if it becomes apparent Vinatieri won't be ready to go by the weekend. Vinatieri (groin) is scheduled to undergo an MRI on Monday, Mike Chappell of Fox 59 Indianapolis reports. Analysis: Vinatieri aggravated a right groin injury during Sunday's victory over Buffalo, and the veteran kicker could be in danger of missing time. Don't be shocked if the Colts bring in a free agent early in the week to serve as a possible short-term replacement. Vinatieri is nursing a groin injury, Mike Chappell of Fox 59 News Indianapolis reports. Analysis: Vinatieri seems to have played through injury in Sunday's win over the Bills, in which the 45-year-old missed two extra-point attempts. The veteran kicker will reportedly receive an MRI, so expect more information on the severity of Vinatieri's injury in the coming days. Vinatieri made both his field-goal attempts and all four of his extra-point tries in Sunday's 42-34 loss to the Jets. Analysis: Vinatieri's two field goals both came during the second quarter, getting the Colts on the board from 21 and 31 yards. On the back of Sunday's 10 points, Vinatieri now sports 48 on the campaign, placing him in the top 10 among kickers. Vinatieri made one of two field-goal attempts and all three extra-point tries in Thursday's 38-24 loss to the Patriots. Analysis: Vinatieri uncharacteristically sent a 38-yard attempt off the left upright in the first quarter, but rebounded with a 54-yarder in the second quarter. In so doing, the 45-year-old passed Gary Anderson for second in NFL history with 674 field-goal attempts Thursday. Even in the twilight of his career, Vinatieri has remained effective with a 9-for-11 success rate on field-goal tries this season. Vinatieri (right groin) is listed as active for Thursday night's game against the Patriots. Analysis: Through four games, Vinatieri is averaging a respectable eight points, but his Week 5 prospects could be hampered by the fact the Colts are missing several key skill players. Vinatieri (right groin) is listed as questionable for Thursday night's game against the Patriots. Analysis: The Colts' Week 5 injury report is quite robust, but for now Vinatieri is the team's only kicker, which suggests that he'll probably give it a go Thursday night. Vinatieri didn't practice Tuesday due to a right groin injury. Analysis: Vinatieri was a surprise addition to Indianapolis' injury report. It's possible that the Colts are simply taking a cautious approach to the 45-year-old kicker's health, but his status nonetheless is up in the air for Thursday's game against the Patriots. Vinatieri converted field-goal tries from 42 and 44 yards and nailed both of his extra-point attempts Sunday in the Colts' 37-34 overtime loss to the Texans. Vinatieri converted on all three of his field-goal attempts and one extra point in Sunday's loss to the Eagles. 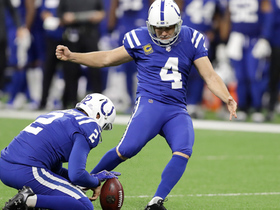 Analysis: Sunday didn't have the best kicking conditions for Vinatieri with the rain falling hard all game, but that didn't impact the veteran kicker from having a successful Sunday. All of Vinatieri's kicks came from 35 yards or less, so he benefitted from the Colts' inability to score in the red zone. Through three weeks, the team's offense looks to be competent enough to keep the reliable kicker relevant this season. 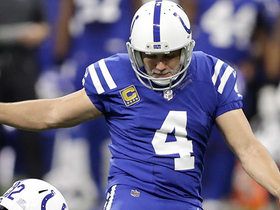 Vinatieri drilled all three of his extra-point attempts in Sunday's win over the Redskins. 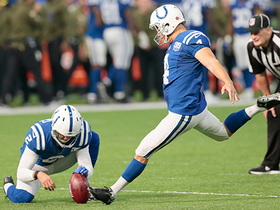 Analysis: On a day where missed kicks stole the show, Vinatieri remained perfect. The absence of field-goal attempts in the contest made it a quiet fantasy outing for one of the greats. Vinatieri made three of four field-goal attempts, missing from 55 yards, in Sunday's loss to the Bengals. He also converted both extra-point attempts. Analysis: Vinatieri made a 51-yard field goal, but missed the longer attempt. He was 12-for-15 from 50 yards or more the previous two seasons, so we wouldn't be too worried about his accuracy on longer field goals despite this being his age-45 season. Vinatieri went 3-of-3 on field-goal attempts in Thursday's preseason win over Seattle. He made field goals from 33, 51 and 45 yards. Analysis: Vinatieri looked in midseason form. The 45-year old could get more scoring chances this year with a healthy Andrew Luck and a Colts defense that's expected to struggle. The Colts and Vinatieri agreed to a one-year contract Thursday, Zak Keefer of The Indianapolis Star reports. Vinatieri plans to re-sign with the Colts on a one-year contract, which is expected to be finalized Thursday, Bob Kravitz of WTHR Channel 13 Indianapolis reports. Vinatieri intends to play a 23rd NFL season in 2018, Adam Schefter of ESPN reports. Analysis: Vinatieri indicated after the Colts' season ended that he had no desire to hang up his cleats, so look for Indianapolis to re-sign the veteran on a one-year deal when he hits free agency in March. Though his scoring production declined in 2017 without Andrew Luck (shoulder) directing the offense, Vinatieri was reliable as usual, converting 29 of 34 field-goal attempts and 22 of 24 extra-point tries. Two of those misses from the field came in challenging blizzard conditions in Buffalo in Week 14. Vinatieri converted both field-goal attempts (from 54 and 22 yards) and both extra-point attempts in Sunday's win over Houston. Analysis: Vinatieri has said he plans to play in 2018 at age 45, but he's a free agent and it's not clear if he'll return to the Colts. Vinatieri may want to play for a team with better playoff prospects. Vinatieri showed he can still kick from long range as he made 5-of-6 field-goal attempts from 50 yards or more in 2017. Vinatieri converted three of five field-goal tries in Sunday's 23-16 loss to the Ravens. He also knocked in his lone extra-point attempt. Analysis: The pair of misses was somewhat excusable, as Vinatieri's 60-yard try at the end of the first half came up short, while his 38-yard attempt in the first quarter was blocked. The veteran now sits at a respectable 27-for-32 mark from the field on the season and doesn't seem intent on calling it quits as he prepares to conclude his 22nd NFL campaign. According to Kevin Patra of NFL.com, Vinatieri, who turned 45 years old this week, said he plans on playing in 2018. Vinatieri made both field-goal attempts (from 39 and 45 yards) and his only extra-point attempt in Thursday's loss to Denver. Analysis: Vinatieri missed both field-goal attempts last week at Buffalo amid brutal blizzard conditions, but bounced back when home in a dome. Vinatieri missed both field-goal attempts from 43 and 33 yards in blizzard conditions in Sunday's 13-7 overtime loss at Buffalo. He did make a 43-yard extra point attempt. Analysis: It was almost impossible to convert any field-goal attempts amid blowing wind and six inches of snow, so it's hard to read too much into his misses. It was more amazing that Vinatieri actually converted the 43-yard extra-point attempt that had been pushed back after a penalty. Vinatieri's scoring opportunities could be limited Sunday with heavy snow hitting the Buffalo region. Analysis: Vinatieri's fantasy prospects were bleak enough with a weak Colts offense supporting him, but the weather in Buffalo certainly won't do him any favors. Heading into Sunday, the veteran owns an 11-for-20 mark on career field-goal attempts in Orchard Park, by far his worst success rate at any opposing venue. 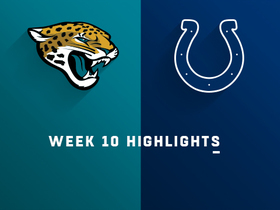 Vinatieri made a 27-yard field goal and his lone extra-point try in Sunday's 30-10 loss to the Jaguars. Analysis: Vinatieri has now made 22 of 23 field goals this season, helping him accumulate 83 points thus far. 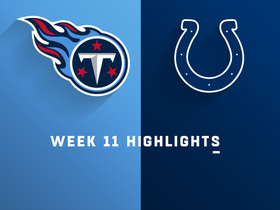 Vinatieri converted all three of his field-goal attempts and his only extra-point try en route to 10 points in Sunday's 20-16 loss to the Titans. Analysis: Vinatieri has now tallied double digits in four of his last six outings, moving him into the top 15 in scoring this season. 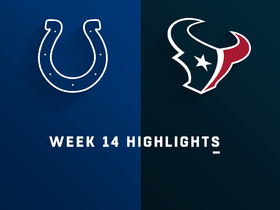 Vinatieri converted both of his field-goal attempts and both of his extra-point tries en route to eight points in Sunday's 20-14 win over the Texans. Analysis: Vinatieri moved into second on the NFL's career scoring list with his performance, which included a 53-yard make. Although he hasn't missed a field goal since Week 1, the Colts' eighth-worst scoring offense leaves Vinatieri in 14th in scoring among kickers this season. Vinatieri (back) practiced fully Thursday. 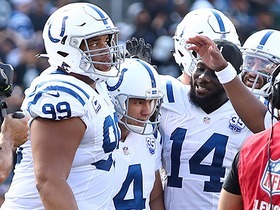 Analysis: Vinatieri is slated to be available to kick Sunday against the Texans, working behind an offense that's now slated to be helmed by QB Jacoby Brissett for the remainder of the season with Andrew Luck headed to IR. Vinatieri has been a marginal fantasy option to date due to his team's inconsistent offense, and he's averaged a modest eight points per game thus far. Vinatieri (back) did not practice Wednesday. 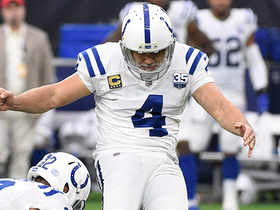 Analysis: More on Vinatieri's status as the week rolls along, but we'd expect him to suit up Sunday against the Texans, as long as the Colts refrain from auditioning other kickers in the coming days.